On Monday, March 18th, WQED aired a story on the Journey to Medicine program that is offered at WISER. Journey to Medicine is a 7 month program, developed jointly between WISER and the Gateway Medical Society. It is designed to address the growing need for minorities in the field of medicine. 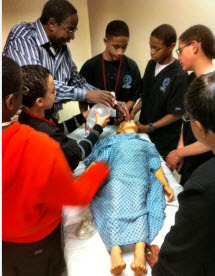 The group consists African-American boys who are interested in pursuing a career in the medical field. The motto of this group is "building the pipeline for future physicians". When Journey to Medicine was created, there were three objectives in mind: To mentor and build a strong sense of confidence in our pre-adolescent participants, to stress the early importance of achievement in mathematics and science, and to introduce a broader view of all disciplines of medicine and allied health professions, including but not limited to Nursing, Occupational Therapy, Physical Therapy, Respiratory Therapy, Physician Assistant, Pharmacy, Dentistry, and Podiatry. According to the American Medical Association, 10% of U.S. men 30 and older are African-American, but less than 3% of practicing doctors are African-American men. It was because of this information that the Gateway Medical Society decided to start the Journey to Medicine Program in 2010. With this, 15 African-American 6th grade boys were chosen from public schools to attend regular educational activities. These educational activities teach skills from PowerPoint presentation and public speaking to suturing a cow heart and performing CPR on a simulation manikin. Each student is mentored for the duration of the program by a Gateway physicians member, and all fifteen students will progress through the program together. Students will remain involved with the Journey to Medicine program through their high school education and will offer different lessons and schedules every year. Journey to Medicine started coming to WISER in September of 2011. During their time here at WISER, the young men use simulation to achieve their learning objectives for their specific rotations. These rotations include Emergency Medicine, Anesthesia, Pediatrics, Code Team Training, Pediatric Emergency Medicine, Obstetrics, Surgery, and Pharmacology.